I want to share my heart with you. There are many people in the world today that are beginning to have “Enoch” like experiences. Over the past years I have heard the statement “walking with God like Enoch did”. God is moving so quickly and powerfully now that walking with God like Enoch did will become a common experience. I believe soon there will come such an intimacy in the body of Christ with Christ that this statement will change to “walking with God like *insert your name here*”. God desires an intimacy with His people that is greater than we can yet understand. He wants someone to walk with and to stand with in truth. This book was born out of vision and is comprised of visions. My prayer is that this writing will catapult the reader into greater levels of intimacy and truth with the Father, Jesus Christ, and the precious Holy Spirit. 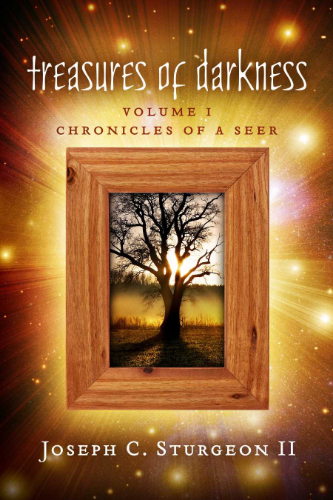 Joseph Sturgeon has released the first book in his Treasures of Darkness series, Chronicles of a Seer. Inside Joseph describes many visitations with Jesus, to Heaven and how he started his amazing journey. In reading Chronicles of a Seer you will be deeply impressed by the kindness of Jesus, the greatness of his kingdom and what is available to every believer.